Do you love alcoholic Ginger beer? Then this independent brewer in Holloway, North London in my opinion sell some of the best Ginger Beers you can buy that is brewed in London. Umbrella Ginger Beer is brewed in a restored and converted brewery that once was fire wrecked. Once a month five different brewers or bartenders are invited onto a unique tour. Head brewer Matt Armitage will tell the story of Umbrella Brewing whilst showing the groups around the Victorian industrial building where all their ginger beer is produced. Matt will explain how the liquid is made, and give a run through of each step of the brewing process and how they get the most out of the natural ingredients. He will also teach bartenders in how they can make ginger beer based cocktails, so that they can be served in the bars. 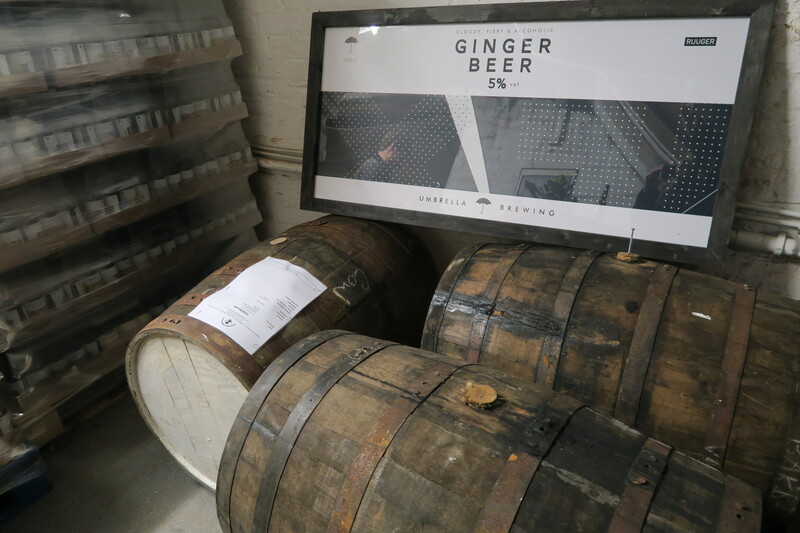 They do not have tours for the public but me and some others from Love Pop Ups London community we all had the opportunity to experience a one off tour of their factory and we got to taste various ginger beers which they produce. To find out more about Umbrella Brewing and their Ginger Beer click here. Thanks to Matt of Umbrella Brewing for letting some of the community members of Love Pop Ups London come down to experience the unique tour. Read all blogs/reviews from the comments from below. Great discovery, I wasn’t familiar with their beer before the tour. I stopped buying ginger beers some time ago as the ones from shops are either too sweet or too spicy. Umbrella Brewery gets all the flavours right and they are all natural. Learning about the complex brewing process this was fascinating and Matt clearly is intensely passionate about it. Really looking forward to the launch of their cider as what I’ve tried so far was delish. Last night, I had the opportunity to tour the Umbrella brewing brewery thanks to lovepopupslondon! Hosted by creator and co-owner Matt Armitage, we were welcomed with a ginger beer cocktail to warm us up. We then munched on some bbq treats to then proceed to the explanation of how their ginger beer is made and then the tasting. Not usually a fan of ginger or beer, I was pleasantly surprised by how harmonious the beer was.Yes, the fierceness of the ginger is well present but the spice takes you progressively as opposed to other ginger beers I have tasted before where it kicks your palate right from the beginning and kills your taste buds from the get go. But this ginger beer doesn’t only have attitude it also got Artitude. Matt had the unusual idea to use various label designs to make his bottles unique. maker), Too bad (inspired by Matt’s favourite song), Dewars experiment (for their limited edition whisky finished ginger beer), and last but not least the Dead Rabbit (in collaboration with the best bar in the world from NYC)! Best Ginger Beer on the market. When you think of standard bar drinks, your mind goes towards beers on tap, wines in bottles, ciders in the fridge, and the spirits lining the walls behind the bar. Every now and then it’s nice to try something different, and I think that’s where the unique spicy taste of ginger beer comes in. I love non-alcoholic ginger beer but wasn’t so sure about this. The knowledge and love that Matt puts into his product shows in everything from the taste to the label. Try mixing with Gin! Amazing cocktail! I particularly love the beautiful branding and the variety of labels – some showcasing various artists. A really lovely idea which just makes me want to collect every bottle! Can’t wait for Spring/summer to get here, so I can truly indulge in an amazing fiery, all natural Ginger Beer. Alcoholic Ginger Beer! We loved our tour of Umbrella Brewing in London! Our latest Vlog gives you a peak behind the scenes. Thanks to Love Pop Ups London and Umbrella Brewing for our visit.